Apple season is coming up soon so I grabbed a new (to my girls) apple book and came up with some gross motor fun for them. It was an added bonus that we worked on counting and patterns too! First, we sat down and read Ten Apples Up On Top, which was a new story for my girls. They loved counting along and guessing if the characters would be able to balance more apples on top or if they would drop everything. Then, I told them it was going to be their turn to try to balance the apples up on top but to make it trickier, we were going to balance the apples while we walked on our balance beam. -red and/or green pool noodles cut into "apples"
We started with one apple and each girl tried to cross the beam and keep their apple on top. The wind didn't help matters and kept blowing the apples off the girls' heads, so they started to hold them on top of their heads. I figured they were still practicing counting and balancing even when they held the apples on top. Then my oldest had the idea to use a wooden dowel to stack the apples and then she held the wood on the top of her head. Little sister wanted to play along so she found a stick on the ground and threaded the pool noodles on and put it on top of her head. It is funny to watch her walk on the balance beam sideways, while big sister walked with one foot in front of the other. They made it up to ten apples up on top and then they tried to see how many they could fit on their stick and still walk across the balance beam. My 4 year old loved counting the apples and then figuring out how many we had left or how many fell off her head. I loved that this was still challenging for them to complete. When I planned it out, I thought it might be easy for them to walk the beam and the tricky part would be stacking and balancing the apples, but they both had to really concentrate to balance and walk at the same time. 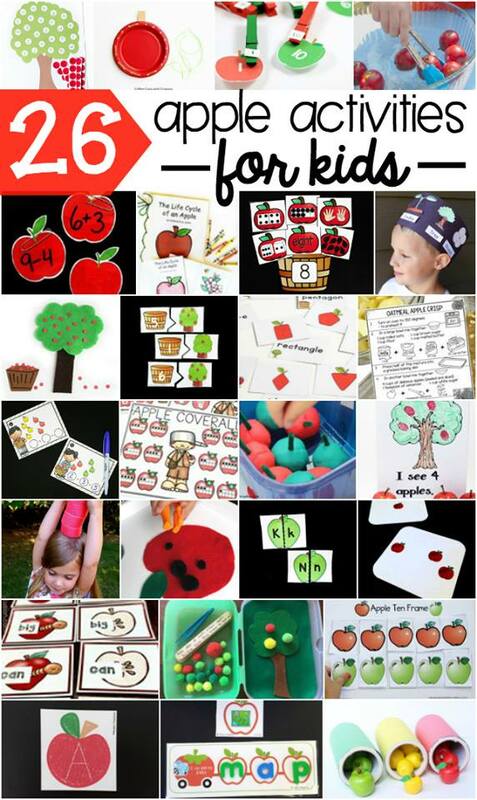 Do you want to play the appleseed match game? I've got it as a freebie for you. I've included numbers 1-20 so you can print out as many seeds as you need for the numbers you want to focus on. Click HERE to grab your freebie and then check out some more apple inspiration below.